Those of you who loved Dojo as much as I did will be pleased to learn that they made good on their promise to relocate after they were forced to close to make room for postgraduate accommodations on Cambridge’s Mill Lane. 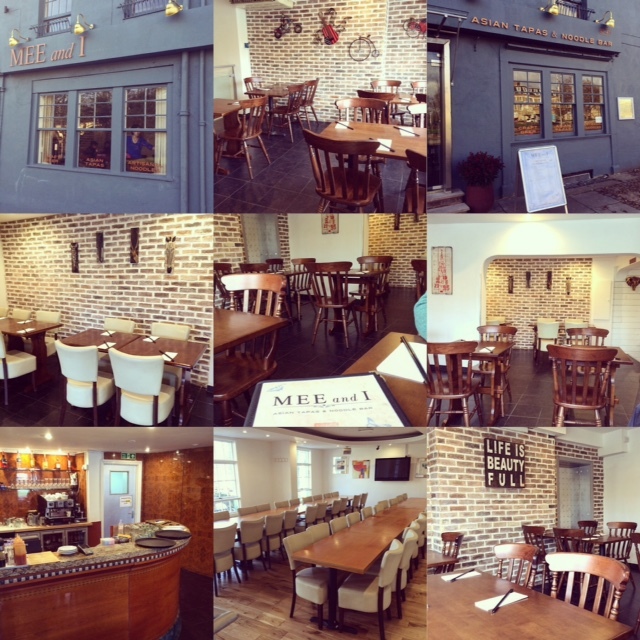 This promise comes in the form of Mee and I, located in Castle Hill, and whilst it’s not another Dojo, their former staff and head chef are part of the Mee and I team. The menu isn’t exactly the same as Dojo’s but it’s still extensive. 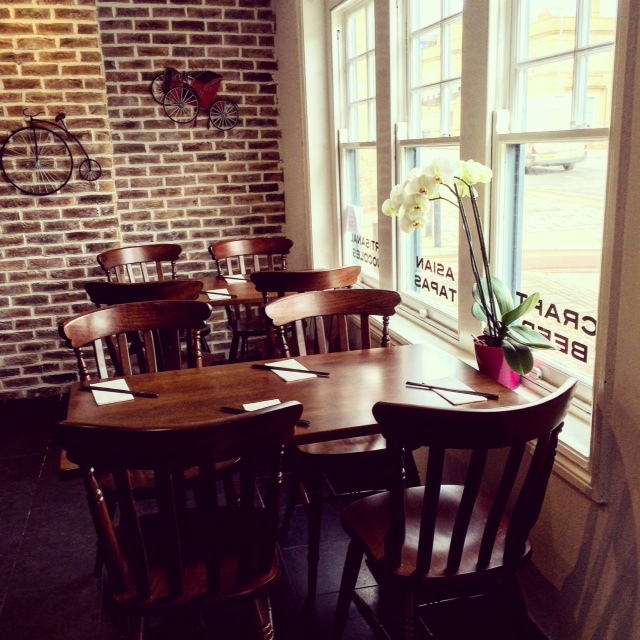 It includes a large selection of sharing plates / starters, bao (Taiwanese steamed buns with a choice of three fillings), salad, rice, noodles (wok tossed or in soups) and curries. Also, the place is way bigger than Dojo was and there is even another floor where the space can be hired out for celebrations and large gatherings. 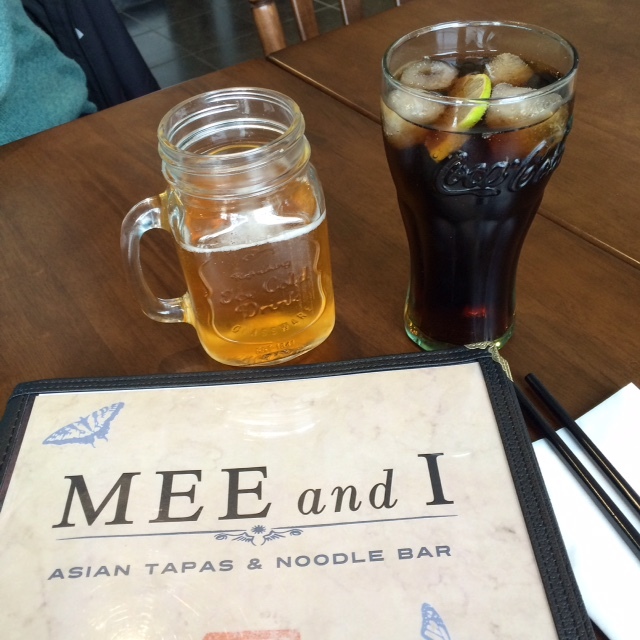 Mee and I describes itself as an Asian tapas and noodle bar. The menu is actually Pan-Asian and features dishes from Singapore, China, Vietnam, Japan, Korea, Malaysia, Thailand and Indonesia. I have to admit that I have a bugbear about the overuse of “tapas” as a catch-all term for small sharing plates. To me, tapas are Spanish dishes but I digress. The word “mee”, and its variations in many of the countries included in the Pan-Asia region, means “noodles” and although these form a large part of the menu, Mee and I is not quite a noodle bar either (not that there’s anything wrong with a noodle bar). My perception of a noodle bar is a casual, café-style place for a quick plate or bowl of noodles. Mee and I is more than that. It’s a proper restaurant with very nice décor that doesn’t reflect any particular culture, which I think is a good thing. Fortunately, my stomach speaks to me from a foodie point of view and not a marketing one, so I didn’t let this description deter me from putting Mee and I on my list of new places to try. Paulo and I decided to pop into Mee and I at lunchtime. We were greeted by smiling and welcoming staff who told us we could choose any table we wanted, then left us to peruse the extensive menu. I have to say I was a bit overwhelmed and probably too hungry to ponder every single menu item so I showed the manager an Instagram photo of the dish I wanted to try and he recognised it right away (it was the satay noodles, more on that later). We ordered drinks – a Chang beer for Paulo, Coke for me. Paulo’s beer was poured into a mason jar with a handle, which I have only previously seen for cocktails. Reactions to this included indifference (Paulo) and mild amusement (me). Subsequent reactions to my photo on Instagram ranged from complete outrage to hysterical laughter. Hey, at least it was memorable. Anyway, the allure of the small sharing plates was too good to pass up so we ended up ordering four dishes from the menu as our starters. 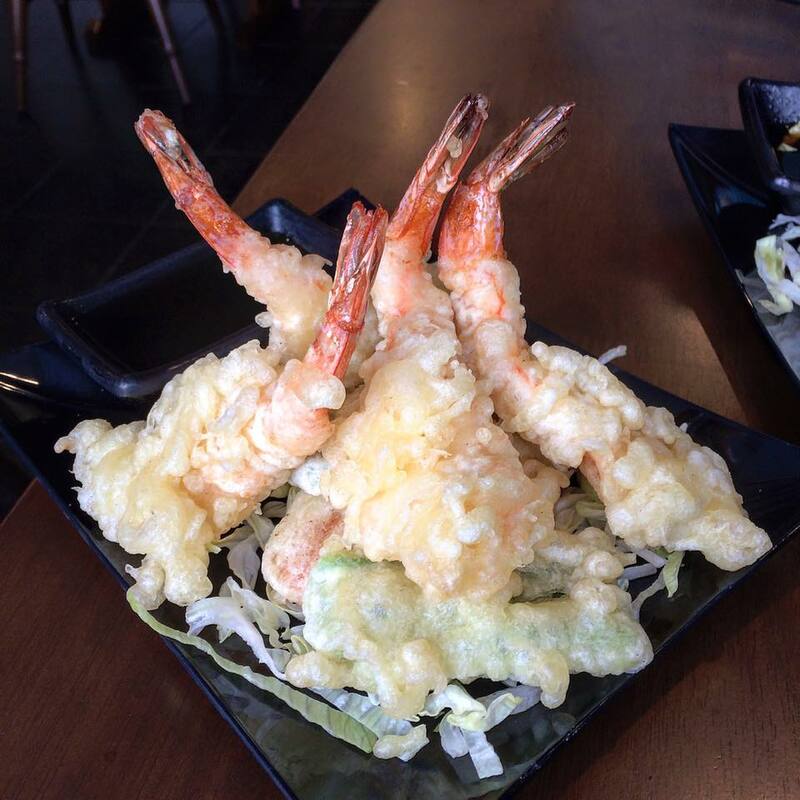 I was pleased that the Tempura Prawns were just as amazing as they were at Dojo’s, with high quality batter that was light, crispy and very tasty. Four king prawns and some vegetables were served with tentsuyu sauce. 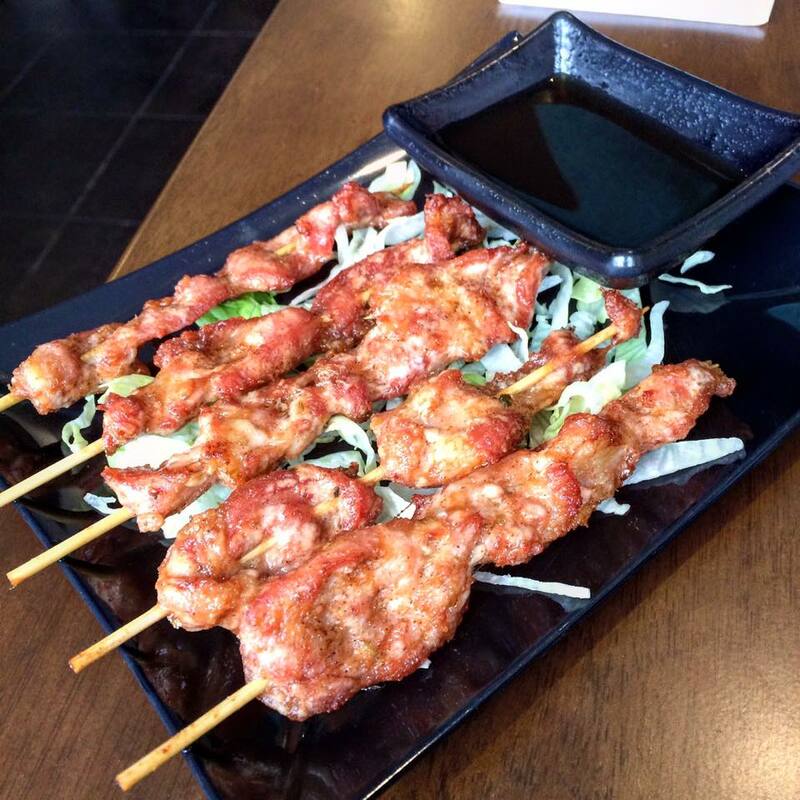 The Moo Ping Pork Skewers were addictive, as stated on the menu. The Thai pork was tender and whatever spices were rubbed on it were spot on. A definite favourite! 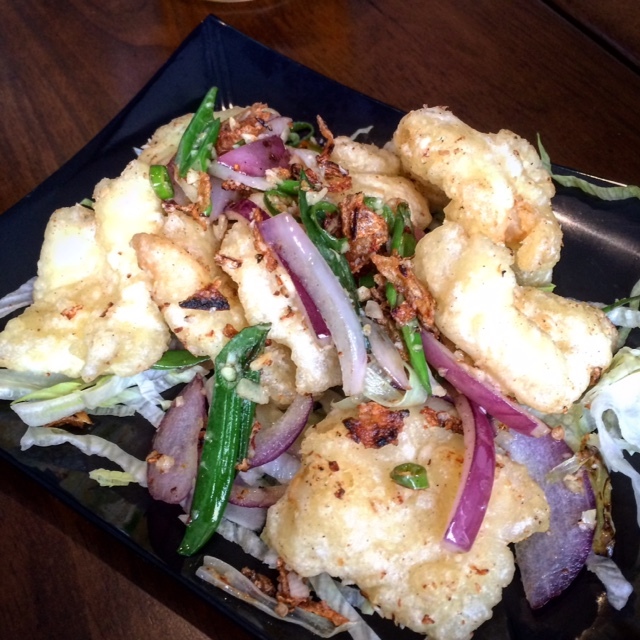 The Salt & Pepper Squid were fried in a thin layer of batter, then sprinkled with Szechuan peppercorns and sea salt, giving them great texture and flavour. The five Chinese dumplings, called Wor Tip Potstickers, were seared (hence the term “potsticker”) and filled with chopped pork and oriental vegetables. 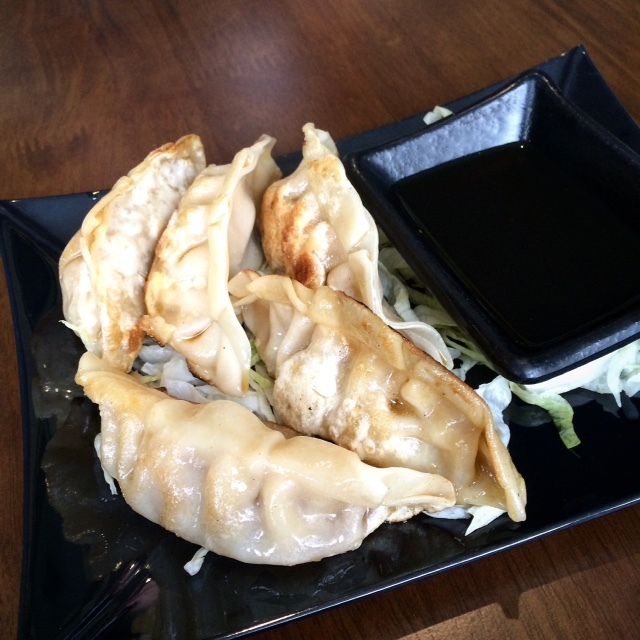 The dumplings were big and quite filling. Excellent! However, all of these delicious sharing plates meant that we struggled to finish our mains. 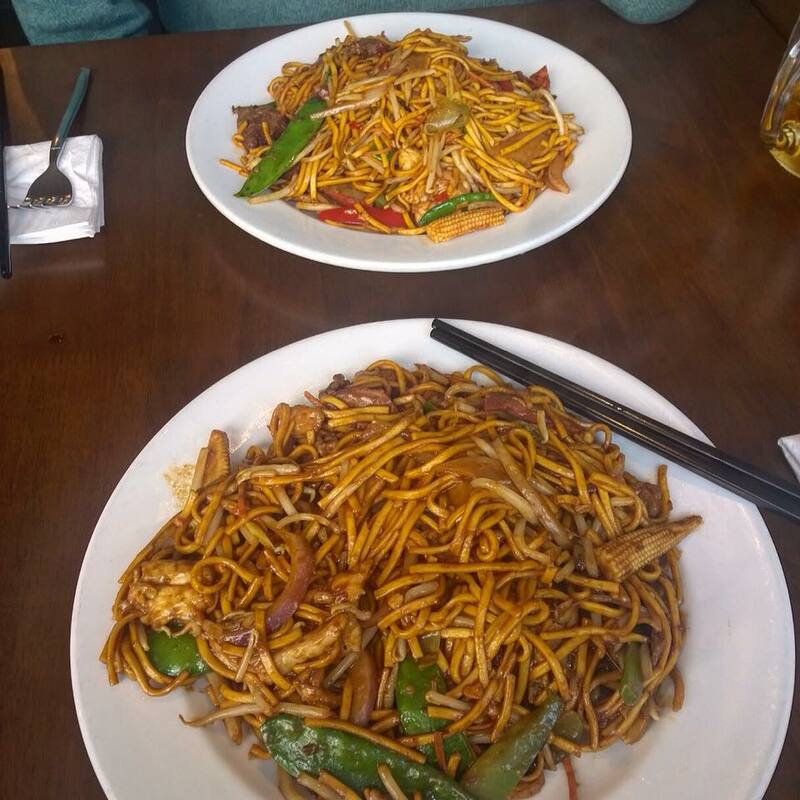 We both ordered wok tossed noodles and the servings were massive. Fortunately, it was no problem to take the rest home and Sunny, the manager, efficiently packed up the noodles in plastic containers. The leftovers were even tastier the next day! I ordered a dish from the Satay Mee section: a Malay-Chinese dish called Chum Chum (No. 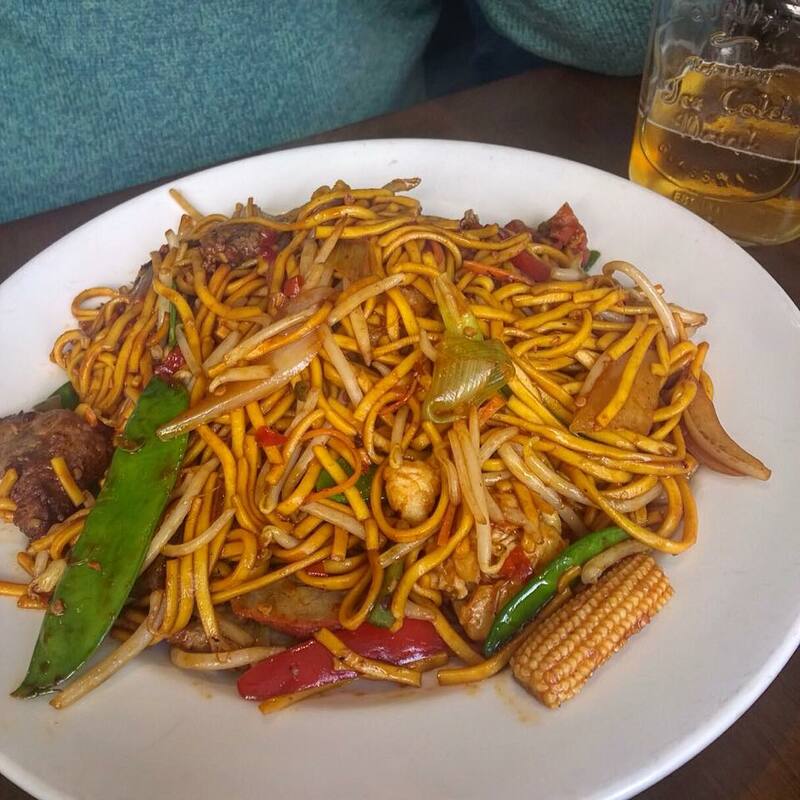 162) which consisted of yellow mee noodles tossed with chicken, char siu (barbecued pork), beef and duck as well as a variety of vegetables such as red peppers, mangetout, baby sweetcorn, bean sprouts and red onions. The Malaysian satay sauce was mildly spicy, at least for my tastes, but that’s how I wanted it. Paulo, on the other hand, is a chilli fiend so he ordered a dish menacingly called “Part 1 – The Way of the Exploding Dragon Fist” from the Angry Mee section (No. 160). It came with a verbal reminder that the lethal secret sauce was extremely spicy. Like burn-your-head-off spicy! I didn’t dare touch it, let alone taste it, for fear of an exploding dragon fist making an appearance in my mouth. The dish included the same meat and vegetables as mine. I double checked to make sure we didn’t get our leftovers mixed up when we took them home. Paulo said the dish was even spicier the next day. I guess that would be Part 2, after the dragon fist explodes and the flavours are left to seep into the noodles! 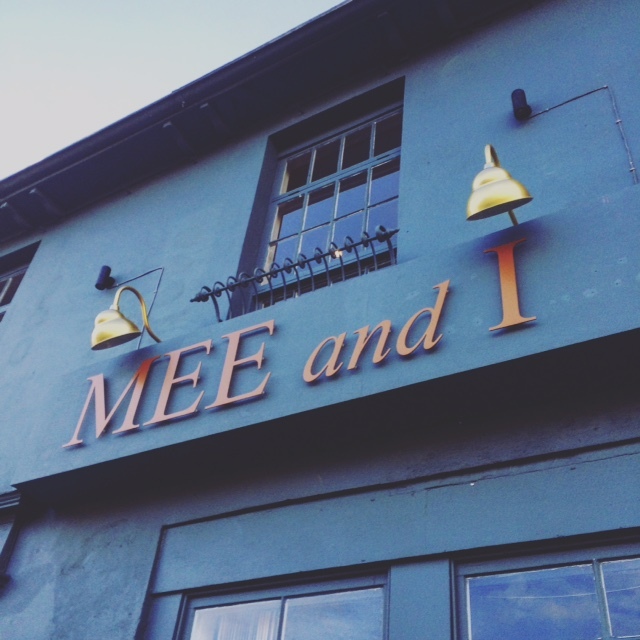 Mee and I definitely merits many return visits to feast on our favourites but also to try the other dishes on their impressive menu. I used to love Dojo’s big bowls of comforting soup and Mee and I offer several options. 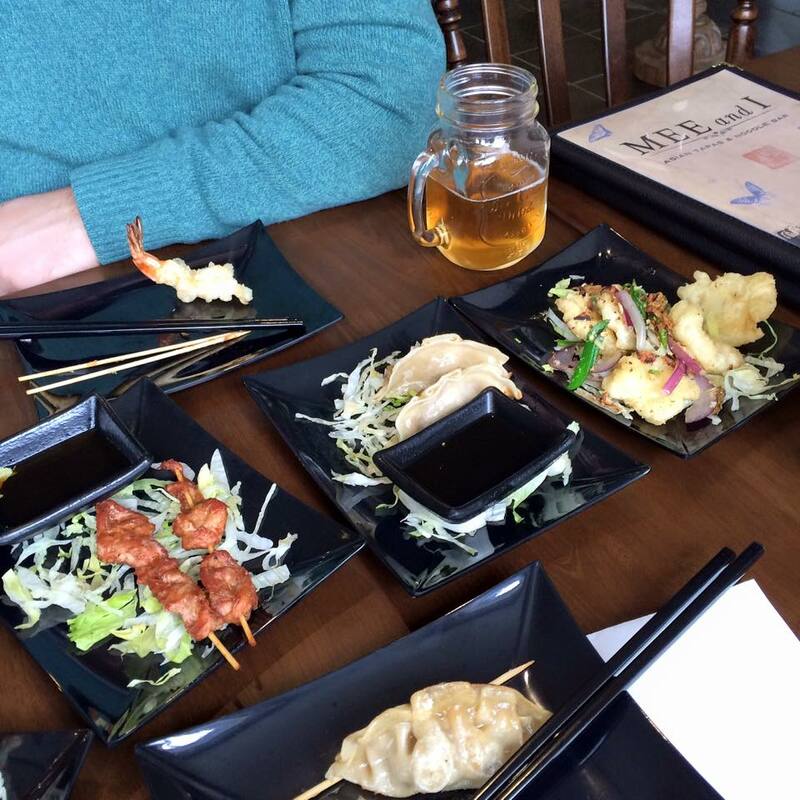 I’m also tempted to just order a variety of small sharing plates and enjoy a few drinks. Every item on the menu sounds delicious so it’s just a matter of ordering what reflects your mood. And remember, no waste, so don’t be shy to ask to take your leftovers home! This entry was posted in Restaurants and tagged Cambridge, Castle Hill, Dojo, Mee and I, noodle bar, noodles, Pan-Asia, tapas by One Two Culinary Stew. Bookmark the permalink.